This is an exciting time for the Senators, as they get a their first taste of their role for the year ahead. 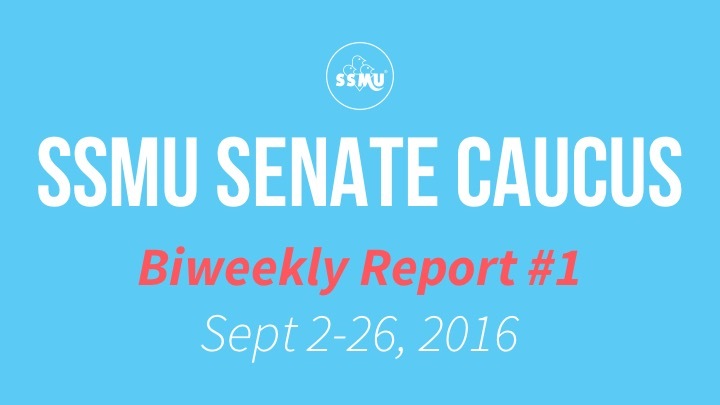 We present to you the first biweekly report of the SSMU Senate Caucus. The Senators attended various kinds of training over the past two weeks, including during the SSMU Councillors and Senators retreat two weekends ago. We completed allocations of students to fill in more than 110 undergraduate representative seats in 47 University-level committees. The Senators themselves sit on many of these spots, and will work on many of their projects from this front. The list of committees (including the description of each committee) and the representatives are available here. Thank you to those who applied! Students in many faculties now are allowed to have their first final exam deferral granted, without having to submit any supporting documentation (only for the first ever deferral during the student’s degree). Read about it in the report! Teaching and Learning Services (TLS) have just launched a new Steering Committee to plan an Undergraduate Skills Program, which is created to enrich students’ undergraduate education experience by giving them skills they will need in the workforce and beyond. If you’re interested in attending a Senate Caucus meeting to learn more about what the Senators do, feel free to email me (the UA Secretary) to get more information. Senate Caucus meetings are held every Monday at 6:30 PM in the SSMU Office. We also sent out our first University Affairs Listserv! Click here to join the mailing list. Welcome to a new school year! My name is Erin Sobat and I’m incredibly excited to be serving as your SSMU VP University Affairs for 2016-2017. The UA team is responsible for university representation and academic affairs; research, advocacy, and policy development; equity programming and complaints; and the Library Improvement Fund. You can always get in touch via email or drop by my office hours on Thursdays between 10:00AM-12:00PM. Check out my first report to the SSMU Legislative Council to find out what I’ve been up to!